Short sales are becoming more of a topic as overburdened real estate investors in Pensacola and Destin Florida look to relieve themselves of top heavy mortgage obligations. Savvy investors know to be aware of possible tax liabilities and the effect short sales have on your credit rating. Click Here To See The Latest Pensacola Short Sale Properties For Sale. Homeowners will need to consider the effect that short selling will have on their credit rating. A lender will typically report a short sale transaction to the credit bureau. While it may be better than a foreclosure, a short sale will undoubtedly leave a considerable mark on your credit report. Short sales occur when a lender accepts an amount less than the amount mortgaged as the total payment to settle the real estate debt obligation. The lender allows the homeowner to sell the property for less than the amount owed on the property. For example, assume your home's mortgage is $200,000 and you have fallen behind on your mortgage. You decide you need to sell your home to be relieved of the remaining mortgage. Your real estate agent tells you based upon recent sales in your area that similar properties sell for $170,000 today. The problem is that the homeowner who sells their home in a short sale may face a significant tax bill based on the amount of the mortgage balance. Having the lender forgive the debt does not lessen the tax liability. Taxes are due on the property is taxed as if sold for the total outstanding amount of the real estate loan, or the sale price, whichever is higher. If the bank were to forgive the $30,000 deficit, the money is reported to the IRS as cancelled mortgage debt on your behalf. 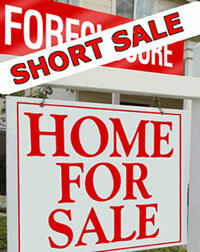 The IRS considers short sale to be a debt cancellation. Your Bank will send you an IRS Form 1099C - Cancellation of Debt. The IRS views the cancelled or forgiven mortgage as income to the borrower in the year of debt cancellation. You may end up with a large and unexpected bill on April 15th of the next year. Banks do not always agree to short sales and generally will not consider one too early in the process. Short sales are easier to negotiate if you already have a purchase contract from a qualified buyer. The Bank will make its decision based on numerous factors including the best interest of the depositors and the hardship of the homeowner. They are required to prove that they are insolvent in an audit process that can take weeks or months to complete. The taxability of the gain and deductibility of the loss depend on the nature of the property. The loss may be deductible if your property is a rental property. Contact an accountant to determine what options are available to you before you short sell your real estate. Our dedicated Pensacola and Destin Realtors have outstanding reputations for service and results for Buyers and Sellers in the Destin and Pensacola Real Estate markets. Contact us for more information about Pensacola short sales.